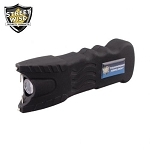 Most Powerful Stun Baton: Streetwise Security Products has been providing top rated stun guns and batons for over 20 years and this is the strongest model we have produced! Combining the power of this 10 million stun baton with our Triple Stun Technology (TST), the loud and bright electrical burst illuminates the entire top of the stun baton and will quickly take down anyone unfortunate enough to come in contact with it. 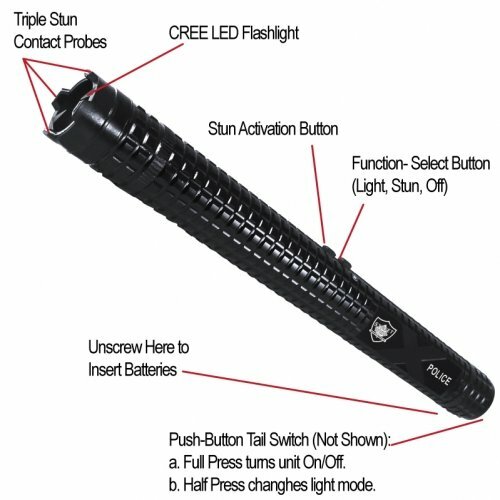 Blinding 3 Watt CREE LED with 3 Light Modes: This is the strongest light we have ever seen built in to a stun baton. It will not only safety illuminate the entire area at night but can also be used to protect you. 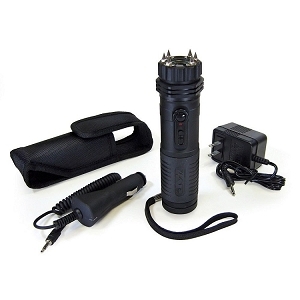 When shinned in the eyes of an attacker, the ultra-bright 150* lumen light can have a temporary blinding effect making it easy for you to immobilize them with the stun gun or strike with the baton. (Note: 150 are the actual lumens. This light is extremely bright and some companies will exaggerate this number and claim a light this bright to be 300 lumens or more). 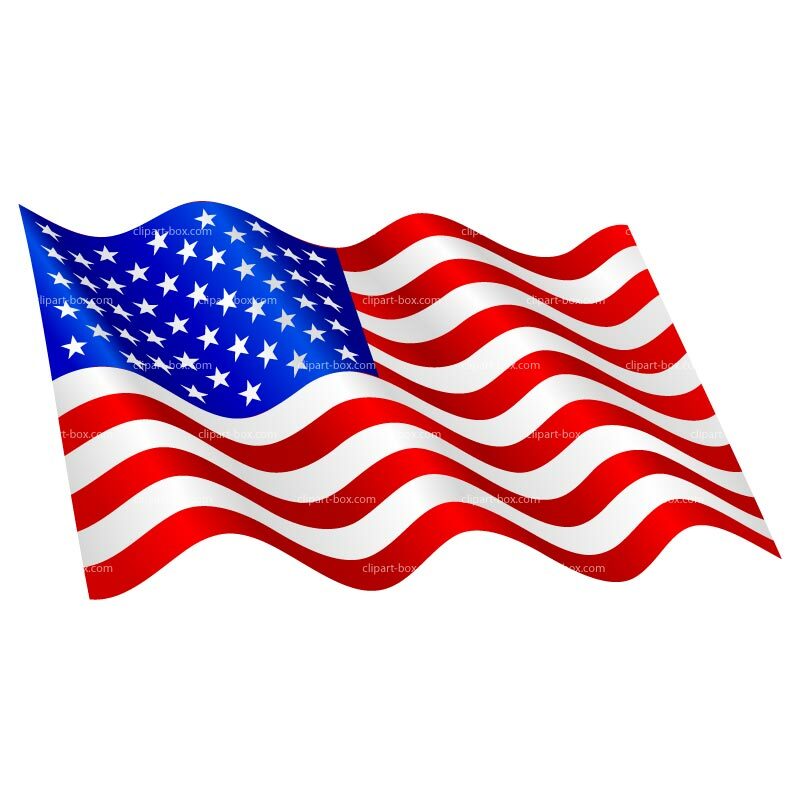 Disorient the Attacker: Shining the ultra-bright light directly into someone's eyes will cause several seconds of disorientation and impaired vision. 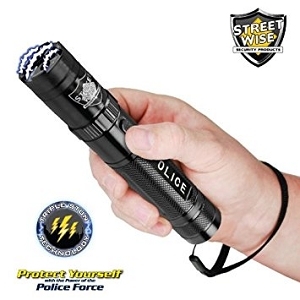 The Police Force 10,000,000 Metal Tactical Stun Baton Flashlight boasts a super bright light beam with Self Defense Strobe that can disorient your attacker and give you time to flee. 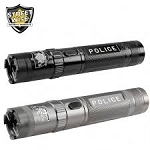 Triple Stun Technology: The SWPFTB10R incorporates Triple Stun Technology (TST) which allows the electrical charge to alternate between three separate points on the top of the stun baton (two sides and the middle). 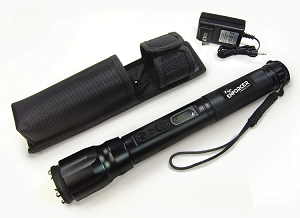 This loud and bright electrical burst illuminates the entire top of the stun baton. Just the sight and sound of this intimidating electrical charge is often enough to stop an attacker, and if not, a jolt from this unit certainly will!